‘Tis the time of Yuletide Glee! This is also the song of the day. There were no Christmas trees in England in the 16th centry, since the were introduced by Queen Victoria as a loving tribute to her Albert, or perhaps the other way round. In any case, they were a German custom unknown in England at that time. So the words have changed since Morley wrote it, or he didn’t write it, or perhaps “Christmas trees” had some other meaning in those days. No matter. Tis the time of yuletide glee and there’s no reason for us to be troubled by these little things. I have already baked some cookies this morning. In fact, I have already burned some cookies this morning. I think I should dress and shower and have breakfast and otherwise wake up properly so I won’t burn any more. I plan a domestic day today, with just a few hours of work and much celebration. That’s the plan. 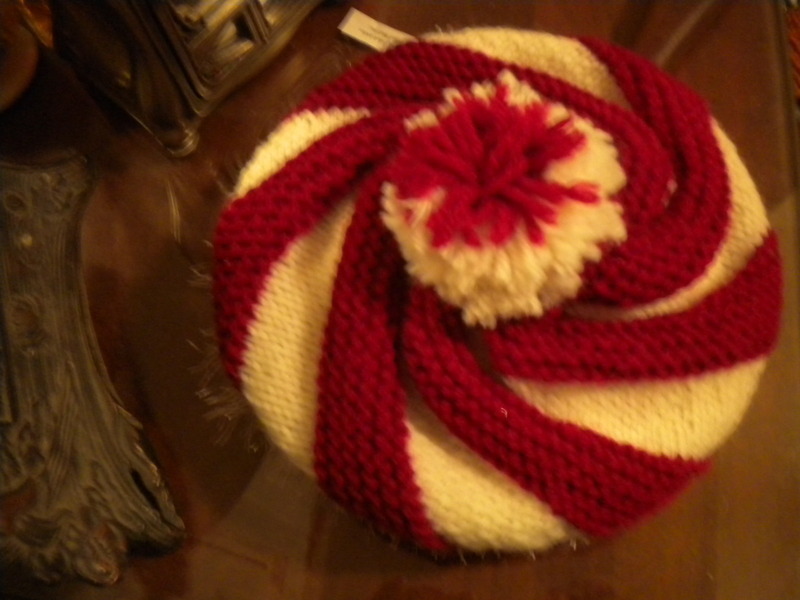 and here’s a hat I made for #1 daughter.